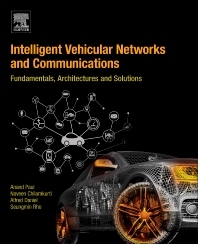 Intelligent Vehicular Network and Communications: Fundamentals, Architectures and Solutions begins with discussions on how the transportation system has transformed into today’s Intelligent Transportation System (ITS). It explores the design goals, challenges, and frameworks for modeling an ITS network, discussing vehicular network model technologies, mobility management architectures, and routing mechanisms and protocols. It looks at the Internet of Vehicles, the vehicular cloud, and vehicular network security and privacy issues. The book investigates cooperative vehicular systems, a promising solution for addressing current and future traffic safety needs, also exploring cooperative cognitive intelligence, with special attention to spectral efficiency, spectral scarcity, and high mobility. In addition, users will find a thorough examination of experimental work in such areas as Controller Area Network protocol and working function of On Board Unit, as well as working principles of roadside unit and other infrastructural nodes. Finally, the book examines big data in vehicular networks, exploring various business models, application scenarios, and real-time analytics, concluding with a look at autonomous vehicles. Anand Paul is currently working in The School of Computer Science and Engineering, Kyungpook National University, South Korea as Associate Professor. He got his Ph.D. degree in the electrical engineering at National Cheng Kung University, Taiwan, R.O.C. in 2010. His research interests include Algorithm and Architecture Reconfigurable Embedded Computing. He is a delegate representing South Korea for M2M focus group and for MPEG. He has been awarded Outstanding International Student Scholarship, and in 2009, 2015 he won the best paper award in national computer Symposium, in Taipei Taiwan and international conference on Softcomputing and network security, India. Naveen Chilamkurti is Acting Head of Department, Computer Science and Computer Engineering, La Trobe University, Melbourne, Australia. He is Editor-in-Chief of International Journal of Wireless Networks and Broadband Technologies, and Associate Editor of several other international journals. Dr. Naveen has published more than 165 journal and conference papers, and his research includes intelligent transport systems, wireless multimedia, and wireless sensor networks. Alfred Daniel is currently an assistant professor of Research and Cloud Computing at SNS College of Technology in Coimbatore, India. His research interests incllude Computer Architecture, artificial intelligence, and computer networks. Dr. Seungmin Rho, Ph.D. is a faculty of Department of Media Software at Sungkyul University in Korea. In 2012, he was an assistant professor at Division of Information and Communication in Baekseok University. In 2009-2011, he had been working as a Research Professor at School of Electrical Engineering in Korea University. In 2008-2009, he was a Postdoctoral Research Fellow at the Computer Music Lab of the School of Computer Science in Carnegie Mellon University. He gained his B.Science. (2001) in Computer Science from Ajou University, Korea (South), M.Science. (2003) and Ph.D. (2008) in Information and Communication Technology from the Graduate School of Information and Communication at Ajou University. He visited Multimedia Systems and Networking Lab. in Univ. of Texas at Dallas from Dec. 2003 to March 2004. Before he joined the Computer Sciences Department of Ajou University, he spent two years in industry. His current research interests include database, big data analysis, music retrieval, multimedia systems, machine learning, knowledge management as well as computational intelligence.